It is the most ancient of the doors after the 800 demolitions. It is found to the extremity of a leaning narrow stradina that was anciently open to the foot of a tower. Images of this passage don't be had, because sketches of the place have not been found again. You/he/she was perhaps modernized by the architect after the tower of St. Bacolo. Of the tower today the door and a shred of the cord it is visible. 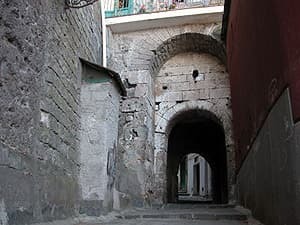 In the XV century the door of the Marina Grande was the only access to the city from the side of the sea, even if you/he/she has been rehandled more times, it stays the most ancient, and it is possible to ascertain him/it from the apparatus perfect isodomico, from the perfect adhesion of the blocks, the two walls that flanked the street from the outside and that they conducted to the door. Ancient it is also the plant of the double door that is folded up according to the curve of the slope.